"It makes a great morning quickie for when you're on the go!" 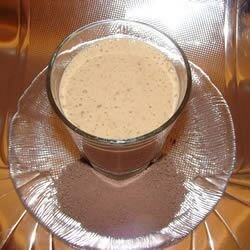 In a blender, combine milk, malt powder and banana. Blend until smooth. Pour into glasses and serve. This is ok, but in my opinion the banana MUST be frozen! I'd also use less milk - about half, maybe add some yogurt. A tablespoon of peanut butter wouldn't hurt, either! yummie we add peanut butter.